Lighted magnifying mirrors make it possible to see yourself better for a cleaner shave, a precision lipstick application and a styled hair. As one's macular degeneration progresses the need for more magnification and more light becomes more important - even in the bathroom. This macular degeneration aid can help with putting on and taking off make-up, styling hair, tweezing, shaving or other grooming tasks. Make your morning routine a bit simpler and look put together by actually seeing what you look like before you walk out the door. These mirrors range in price from $25 to over $200 and come in many different styles - pedestal, wall mounted and lighted. Not all lighted magnifying mirrors have the same brightness or type of lighting. The two most common types of lighting people are a circular fluorescent bulb which features no shadows and the light is evenly distributed and the other is bright LED lights. Magnification power ranges from 2x - 10X. Flip over the mirror for stronger magnification. Power sources can be battery operated, electric cord or some wall mounted mirrors are hard wired. The larger the magnification, the smaller the viewing field. If you are selecting a higher magnification, purchase the mirror with the largest viewing field. Higher quality mirrors are distortion free which is imperative for those with macular degeneration. 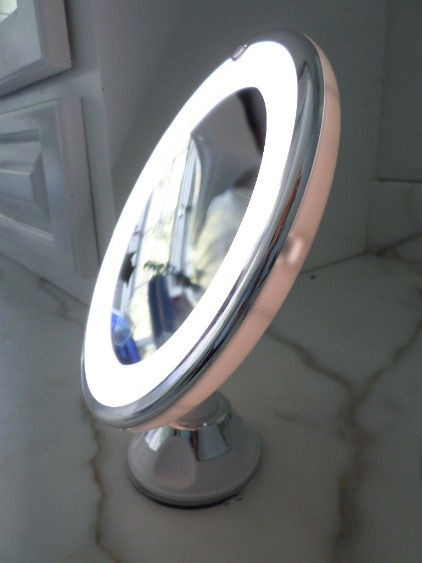 A distortion free optical quality mirror for better clarity and a diffused ring light from LED's to minimize the shadows make this lighted magnifying mirror a great aid for your personal care routine. It can swivel 360 degrees so you can adjust it to any angle for putting on make-up, shaving or tweezing. Move it to any spot in your bathroom as it is dual powered. For use with batteries place 4 AA batteries into the battery compartment. You still need to do your hair and make-up when traveling so bring this travel makeup mirror with you - along with some extra batteries. It won't take up much space in your suitcase as it folds down to just 1". This travel makeup mirror uses 8 bright LED lights that circle the mirror which illuminates the entire face. Be aware that it is only battery powered so as the batteries start to die the lights start to dim so bring extra AAA batteries. It uses 3 AAA batteries. Lighted magnifying mirrors make your morning routine go easier when you can see yourself better.